Satchel & Page, based in Austin, Texas, has quickly made a name for themselves in the leather world. After successfully funding two Kickstarter campaigns for their leather bags and belts, they recently launched a third campaign for their leather belts. We’ve reviewed several Satchel & Page products, including their Mailbag and Bomber Jacket, and found their products to be top-notch. 1. Custom made for you. For any occasion. – With two width options (1.5 + 1.25), you are covered for casual wear with jeans, and formal/office wear with slacks. 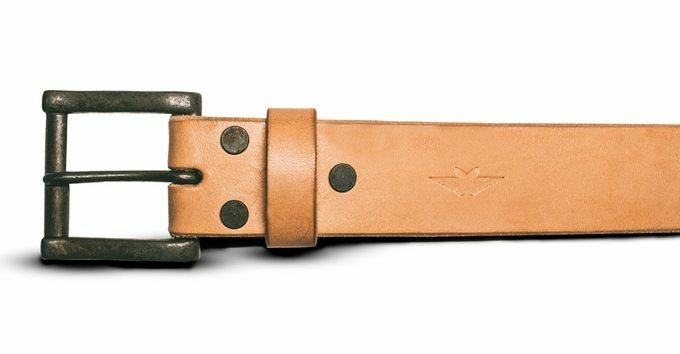 And with 4 leather and 4 hardware options, you can create a belt just how you want it. They all come with the same exceptional quality and lifetime guarantee. 2. The highest grade leather hides – 10 -12 oz. full-grain, vegetable tanned leather from only US origin cows. It’s simple: The best hides make the best belts. See below infographic. 3. Military grade brass hardware – We offer the standard antique brass and silver matte finishes, but we also wanted to offer some unique finishes that you can’t find anywhere else. So we developed our own process to hand antique finish the Iron Rust and Copper Patina hardware, which makes each one of these buckles just a little different. This Kickstarter has blown past its original goal of $5,000 and reached its first stretch goal, which is a hand-stitched journal cover. They’re just a few hours away from meeting their second stretch goal, which would allow them to offer their belt in a Chestnut color. Be sure to keep an eye on Satchel & Page’s Kickstarter and for other updates we encourage you to like their Facebook page.